Welcome To The Whippet Health Foundation, Inc.! The Whippet Health Foundation is a tax-exempt nonprofit Corporation formed to provide financial and other support for individuals and organizations focusing their educational and research efforts on dogs in general and the Whippet in particular. To this end, we have launched a comprehensive health database for Whippets which can be accessed via the Database button at the top right of this page. To find out more about our organization, please visit the About Us page. To make a donation, please visit the Donations page. 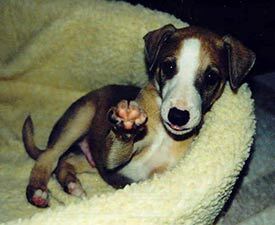 Please use the buttons at the top of this page to access much more information about our organization and Whippet health. While the WHF cannot endorse any specific breeder or breeding program, we welcome links to the WHF website. As a reminder, the Whippet Health Foundation logo is copyrighted and any unauthorized use is prohibited. Dr. Joshua Stern, Assistant Professor, Medicine & Epidemiology,	Veterinary Medicine, University of California-Davis submitted a research proposal to the Canine Health Foundation (CHF) on Whippet mitral valve disease. It has been decided that both the WHF and AWC will fund the project. The Whippet Health Foundation strongly encourages health testing for all Whippets, especially those involved in breeding programs. The WHF is now offering a cash incentive to AWC Futurity class winners whose parents meet certain criteria. A new update on the study of Adult Onset Mitral Valve Disease in Whippets is now available. This research began in 2003 and includes data gathered on hundreds of Whippets at past National Specialties.